Anahilwa is one of a sub-brands of Mikyajy, which is one of most popular Arabic makeup brand in United Arab Emirates and in Middle East. Anahilwa particularly known for its great affordable price tag along with a great quality and color selection. 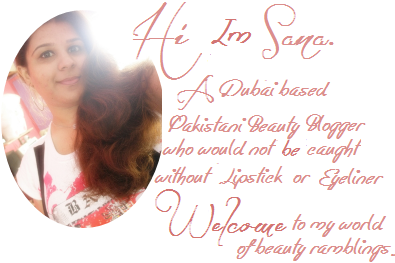 Today's post going to focus on 'Anahilwa Lipstick in 08 Khamis Mushait'. Let's move on now. This not only gives color but infused within to the lips over her glasses every day. Recruit what suits of bright colors of the solar spectrum to completed Atalaltk in all would like. Anahilwa is an Arabic word. 'Ana' means 'I/me' and 'Hilwa' means 'Sweet' but usually in Arab we use to use this phrase to praise someone who's pretty and beautiful. Anahilwa known for its super affordable prices and unique color range. All the names of Anahilwa products kept after a name of the gulf countries and the shade I got is 08 Khamis Mushait, which is a city situated in South-West of Kingdom of Saudia Arabia. 08 Khamis Mushait is a gorgeous soft brown shade with a very faint hint of pink undertone but, when applied on lips it appears as Peachy Coral that leans towards brown somehow which looked utterly beautiful and makes it ideal for fall season but, I love wearing it in spring cause of the fresh warm color. The shade is intense very intense hence truely representing Arabic style as most of the makeup regardless it's lipstick or eye shadows or eyeliner or foundation, all are highly pigmented and having very intense color that is the reason why it goes opaque just in one swipe and you can layer it off if you want more intense color depending what you desire. The lipstick is so moisturizing and has a buttery soft and creamy texture that allows the product to slide over lips smoothly and effortlessly without highlighting those fine lines but, still I'll suggest that you to apply a thin film of lip balm underneath to avoid any disappointments if you have very dry/flaky lips. The formula is so light weight that I'm not wearing anything on lips which means apply and forget that you have something on your lips that is a huge plus in my opinion as I hate product that feels heavy on my lips. The finish is not matte nor a super glossy either it's some what in between which I'll call it semi-matte as it gives semi-matte finish with a very subtle glossy sheen that is not so over-powering. Since it has a creamy texture and moisturizing properties my expectations were already high when it comes to and I'm glad it didn't disappoint me here too. I'll not say it has superb staying power, but for me it was there on my lips for good 4-5 hours without eating/drinking/re-touching after that it starts fading away and dispose off evenly without depositing clumps on lips and around the margins that I hate the most. Over all I'd say I'm in love with them and got couple of other shades and can't wait to try them. If you are living in Middle East and have Mikyajy counter nearby I'd definetely say you must check them out. They are amazing considering their price. You want your lipstick has moisturizing properties. You like semi-matte finish with a very subtle glossy sheen. You don't want lipstick enhance fine lines on your lips. You like intense and color rich lipsticks. You want your lipstick to be long-lasting. You like your lipstick fades away evenly. You want your lipstick to be matte. Availability to be an issue. Mikyajy Anahilwa Lipsticks available on every Mikyajy counter throughout Middle East and priced 19.00 AED/SR. I've got mine from Safeer Mall Ajman. You can check out their Official Website Here. Stay connected with their latest offers and promotions. Join their Facebook and Twitter. What do you think about it? Have you tried anything from Anahilwa yet? 41 comments on "AnaHilwa Lipstick in 08 Khamis Mushait [Review & Swatches]"
Beautiful color! What a great review, thanks for all the information - This looks GREAT on you! wow this is pretty Khamais Mushaiyet is actually a place in KSA! It is such a lovely Shade.. suits on you! How pretty the heart is printed on the lipstick. Arabic is hard for me read ;) Quite different from Latin letters. I remember seeing this brand when I lived in Riyadh! I never bought anything though :( Great review! I've never heard of this, but the lip swatch is stunning. great review! nice colour too :D have never heard of this brand before. Great review! The shade looks gorgeous! Nice photos as well! i had never heard of this brand before! thank you for sharing! Love its shade, especially the heart-shape-stamp!